Today’s contribution comes from longtime friend and reader, Kurt Sasso from TGT Webcomics podcast! As you can see by the date on the story, he wrote this a while ago and I really like it, but I just haven’t had time to work with it. Also, this is only part of the story between these two rookies, just enough to whet your appetite. Enjoy!! Started training in martial arts since the age of six, under multiple sensei’s in the same dojo. They were tough but she liked the discipline. They however had a secret that they kept from her until she stumbled on it. They were HUGE Rival Angel fans and even dressed in their favourite wrestlers colours… Sabrina, The Champ, Brooke and Sun. 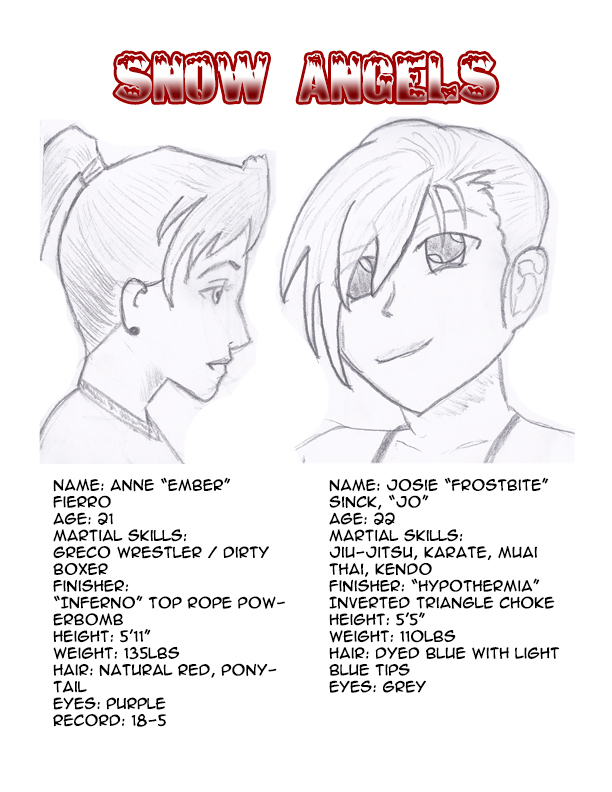 She then focused her time and efforts to bring herself up in the Snow Angels Developmental league. Father was a 4-time Olympic wrestler, 2-time gold, 1 silver, 1 bronze (he feels was his only failure and trains his daughter hard as over compensation) Ember was picked on in school for being too tough and resented men. Met up with Jo in developmental league and they became friends out of the ring and bitter rivals in the ring. Narration: There’s a few things said about Canadians. We are passionate about Sports especially Wrestling. Panel 1: On the big screen pre-recorded; Frostbite (FB). Fans cheering her name. Panel 2: FB comes out to blue fire works on walkway, fans cheering. Panel 3: On the big screen pre-recorded; Ember (Em). Fans cheering her name. Panel 4: Em comes out to red pyro on walkway, fans cheering. Woohoo 🙂 I was wondering when this was going to get posted. Yes, it’s a long time coming for this story, with twists and turns and great wrestling action showing that we Canadians definitely enjoy this sport. About height/weights. For 5’5, 120 lbs (what you have in the description) is fairly slender. 110 lbs (what you have in the picture) is VERY skinny. 135 lbs for a woman 5’11 is also on the thin side.